Many JYJ fans who’ve watched this entire process know that this is a lie. Here are the evidences refuting such a statement. DBSK are disbanding…. Do the two members not even have the drive for their appearance in Kouhaku uta Gassen (紅白歌合戦)? According to a representative from Korea’s SM Entertainment, relationship between Yunho, Changmin (who have decided to remain with the company) and Jaejoong, Yuchun, and Junsu (who filed a lawsuit requesting invalidation of their contract with SM), cannot be recovered. The five members appeared in Kouhaku uta Gassen for the second time in two years and sang their hit song, “Stand by Me.” However, unlike Jaejoong and the two other members who sang enthusiastically, Yunho and Changmin clearly had no drive. In fact, Changmin didn’t even say goodbye to the audience and refused to look at the members. [as a side note, this also disproves Yunho’s claim that “I sang the best I could because I didn’t want to accept that this might be our last performance” – Source: Nate News]. Meanwhile, Avex, the Japanese record company for the group, and SM has talked about solving the issue, but confirmed that the disbandment of the group was unavoidable. Their single “Break Out!” being released this month will most likely be their last single, and afterwards will release a best album on February 17th. Q: Did you know who DBSK were? JS: We’ve especially been talking a lot about our futures recently, aren’t we? YH: Yes, we are. We’ve been talking about that a lot. JS: We especially talk a lot about DBSK’s future, and first, we don’t even have to talk about DBSK always being together…. Because that is something that’s obvious and what all the members recognize, and it’s actually funny for us to even debate on that topic, but I really hope everything will continue to be how it is. But I guess this is more difficult that I thought it would be. We never swayed in that point(staying together as DBSK), but I did get the thought that this might be difficult in our work. I have gotten such a feeling, but I think we can do it in our current situation [“it” referring to the lawsuit]. It might be something that we should be thankful of, but we’ve seen a lot. This really becomes a great strength for us and I think it allows us to develop a broad-mind. As you can see, this interview strongly suggests that Yunho was quite aware of Junsu’s plans to leave SM and, at the time (after all, he doesn’t seem to be confused at all with Junsu’s very suggestive statements), agreed with Junsu’s decision. Evidence #4. YH’s father claims that he knew JYJ was leaving. The following article is an official letter from YH’s father, claiming that JYJ left SM Entertainment solely because of their investments with a cosmetics company. However, we know that the courts recently ruled that the cosmetics company was not responsible for SM & JYJ’s dispute (Creabeau found not responsible , SM’s counter suit against Creabeau dismissed) once again proving this “official statement” completely without basis. However, what this statement proves is that YH’s father and the members were quite well aware of the three members’ intent to leave SM Entertainment. [Translation, Box 1] The two members are aware of the truth behind [the members’ lawsuit against SM Entertainment]. The “truth” here is referring to the three members’ involvement in a certain cosmetics business. Again, from recent court rulings, we know that the “truth” wasn’t a truth at all. However, this statement proves the fact that the two members were aware of the three members filing a lawsuit, whatever the reason might have been. [Translation, Box 2] Once President Kim YoungMin left the room and only DBSK parents were left, a certain father of Jaejoong, Yuchun, or Junsu, claimed that “we will no longer stop working with SM.” Changmin’s father and I tried to convince the remaining parents, but their points of view were firm. 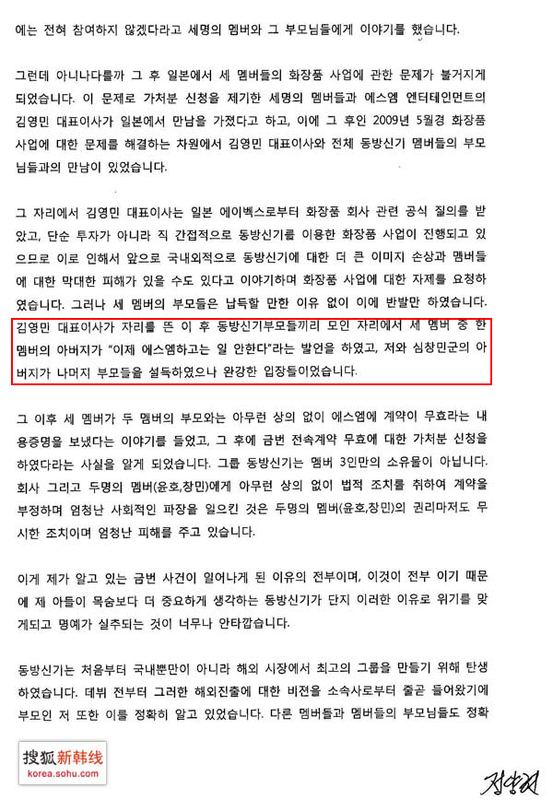 Here, Yunho’s father then claims that during a meeting, one parent of Jaejoong, Yuchun, or Junsu told him and Changmin’s father that they will not work with SM Entertainment (supposedly because of their cosmetics business, but we already know that the courts have already ruled that the members’ lawsuit has is NOT BECAUSE of their business ventures). Once again, this proves that YH and CM’s father (and we can only assume that the two members knew if their fathers knew)were aware of the lawsuit before it was filed. But we still don’t know in what order all of this happened, he just said about how shocked he was about the aplication, but he didn’t say anything about not knowing about it at the last stage… he knew it was going to happen but not when. The talks about the future, and the lawyer memorizing the faces don’t mean anything, lawyers lie all the time. I don’t buy anything. Yunho looked sad at the interview, I think they all miss each other, but fans can’t acknowlegde the fact that they have parted ways. Love them all, and wish for their success, even if they’re not together. He probably would have known; how would JYJ keep it from HoMin when they were contacting their lawyer and what not? It’s just that when you are under pressure by SM, you can’t tell the truth! The way I see it, either Yunho is lying when he says he had no idea or Yunho’s father is lying when he said in his official statement he knew since before the lawsuit was filed. You can’t have it both ways. We already know that Yunho & Changmin have taken SM side but to go on national television and personally and vindictively drag JYJ’s name through the mud with lies is beyond indecency. from what I understand is that, Yunho in this case, what he means is he may not know that they would actually file the lawsuit, idk why he said he didnt know because he knows it for sure, he might just get so nervous at that time to really clear out what he truly means. hope everyone supports both group! look in all honesty i think it would be naive to think that they didnt know the other three were filing for the law suit and i personally think that SME is trying to clean its mess by using HoMin! Yeah, Yunho confused a lot of us with that statement, but still I can’t believe that he is a liar, just as I have complete faith in JYJ. The writer keeps explaining the underlying meaning of the things that our boys said, But who in the world made this person an authority on the matter?!! How can I trust his/her analysis when NO ONE knows what really happened except the boys. Yunho said he didn’t know about the injunction. JYJ filled for the injunction on 31 July 2009. The injunction is a court process that’s used to get a quick judgment on a matter that’s considered urgent. For example, if someone were publishing a book that contains some info damaging your reputation, it would be too late to go through the normal trial process because even if you win the lawsuit to stop the book, it would’ve already been published damaging your reputation. So you file an injunction to stop the book momentarily until the main lawsuit is over. DBSK performed at Kouhaku on 31 December 2009, 5 months after the injunction and Yunho did admitt in the same program “Knee Drop Guru” that by that time, he already knew JYJ’s decision to leave, and expressed what he felt at the stage that might be their last as 5 together. So what’s exactly you are disputing here? Same as the above, Yunho’s father released his official statement on 1 November 2009, about 3 months after JYJ filed their injunction. Yunho essentially said he initially didn’t know that JYJ has filled the injuction, it is only after the injuction has been filled he found out about that. So what makes Yunho’s father’s statement a contradictory “evidence” about this? Oh, come on, don’t me laugh. This is just something you interpreted form what other said. What is suggested, using your own word, that doesn’t prove anything. Again this is based on hints and suggestions. It’s normal for them to talk a lot about their future. I bet any idol band will do. You can keep interpreting others based on your thoughts and opinions, but really you should call it as it is, your personal thoughts, instead “evidence.” Mind you Yunho didn’t hint, suggest, or beat around the bush on the interview. He said it loud and clear, “I didn’t know about the injunction”. If JYJ has an objection about Yunho’s statement, while it is great if they could appear on the same show, they could always hold their own press conference or release their own official statement. Or they can tweet about that. After all, they’ve been known to do a lot of such things before. This is old. But Just want to clarify if any new fans come here and see this. Yunho’s father released sentence in November but he said the members were talking about leaving since February. And if you are leaving a company what did Yunho expect them to do? Did he think SM would let them go breaking contract without a lawsuit. What kind of excuses are these? Well, JYJ could just settle with SM, talk it out without filing a lawsuit , that’s what Yunho meant….Filing a lawsuit is not the only option someone can have. one hunddred percent correct. first everyone dont just say yunho is a honest just cause we love him this is reality leeteuk said the same thing about hangeng and kara’s gyuri said the same thing about the members when they filled a lawsuit as well. i mean how on earth could you especially as a leader not know. he said it was sad as on last concert so how was it sad if jyj told them after the concert it would only be sad if homin already knew and couldn’t convince jyj to stay and were performing together as sm wanted. also they had stopped everything and were not on tv or shows so they already had a breakout without official one and we all know their brotherhood is huge not like other groups of ever even in the 1990s for they all went their ways. but jjyj are still sad becuz they knew if they left together they would’ve made legends and i know that. i say jyj told them and they argued but you know humans aren’t just gonna leave it there so a couple of days passed and jyj already started their lawsuit with help of their parents but homin was thikinh theyd stop anyway and werent worried so when they made the move it surprised them off. but there is no way they didn’t know becuz theyre always together and that is saying jyj didn’t want homin to come along if they didnt say and thats false. i watched a hundred times of thir couples talks in 2008-2009 and if you use your brain youll see in 2009 one they were drifting. especially junsu who was so loving to yunho to always be with them and never be dishonest even in the future sayingit already was starting and their eyes were full of fear and not excited like last year. only jyj were ok but not homin and only 3 months later, they split. Really people do you really think this is THE TRUTH? 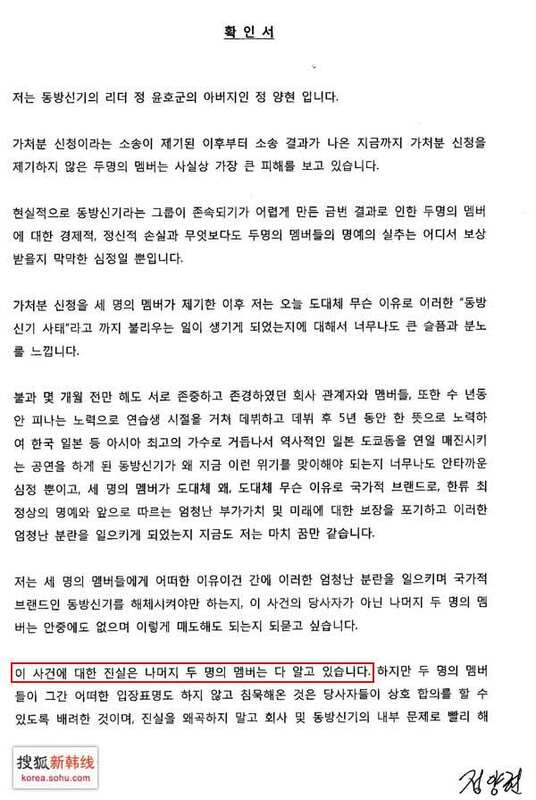 The statement made by YH’s father on November 1st, 2009 is because the situation already uncontrolled. And before that statments if you really cassies im sure you know about 6.25 meetings (June 25,2009) it was held by junsu’s father, yoochun’s mom and jaejoong’s sister and some CJES people. and the facts we got from the voice record of that meeting is The 3’s parents already knew about the split even in that meeting before yunho’s father statments were announced. I was so shocked even this meeting is held in secret until the voice record is out all the people attended that meeting denied the existance of this meeting. If you really want to know the truth with an evidance go to “truetvxq.blogspot” there think again everyone is at fault but whose fault the most. Also i believe yunho is a honest person so if he said he didn’t know until the 3 submitted the lawsuit it means the 3 is not tell him anything i want to say so much more but i think its enough open the truetvxq and read it yourself, how homin has been suffered and endured it so it wont become a bigger problems. You know, you usually don’t want to look at the people that backstabbed you. I was desperately looking for the thumbs up button to this comment. Can’t agree more. Why would Yunho and Changmin want to have anything to do with such lying scums? When 1/2+1 members lives the group, I think there is a problem and that problem is at the leader. And, of course, SM (with lies and more lies, violence, hard words, etc.) and the parents of HOMIN. It’s my opinion. I think JYJ is more strong, confident, brave and … free. I belive in JYJ. TVXQ said at MBC that they didn’t know about the lawsuit. Is it true?